ADIVAN Floppy Disks – best solution for sharing small size files. Can be customized with individual company logo on shutter or with a printed label. Several different possibilities for packaging are available. 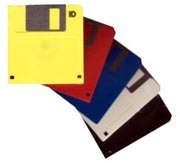 Diskettes are one of the classical data carriers. ADIVAN supplies them empty or copied with data from the user. What Floppy disc products does ADIVAN offer? Specifications for Floppy Disk label can be found at Other Downloads.